REGISTER NOW to join Dr. Colleen Pomplun and Dr. Jennifer Culver, of ChiroPlus, for a wellness seminar to jump start your healthy 2019. This 2-session event kicks off on January 9th in Wautoma or January 10th in Ripon with an overview of how environmental toxins, stress, food and beverage consumption, sleep, and exercise influence your body and mind. We’ll provide you tools to launch a 21-day whole food detox to reset and renew. NEW THIS YEAR…You’ll also have the opportunity to sign-up for 1:1 and/or Group Health Coaching with Dr. Culver. Bring your calendar to the kick-off session to reserve at least 2 free group coaching sessions with Dr. Culver and your peers in the program. One-to-one private sessions with Dr. Culver are also available for a fee. 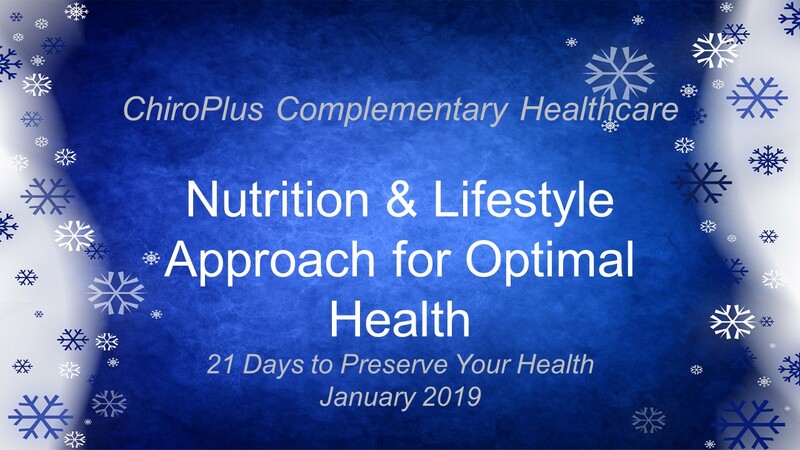 Follow-Up Sessions on Wednesday, January 30th in Wautoma and Thursday, January 31st in Ripon – Your registration here also secures you a seat at the follow-up seminar to review as a group the successes, challenges, and questions/approach to continue towards your optimal health. We look forward to guiding you to a happier, healthier YOU in 2019. As always, you may reach us with questions by calling our Green Lake office at 920-294-3130 or Wautoma office at 920-787-0081.